Winter is not the most likeable season for homeowners, obviously because they ruin lawns! For an unprepared lawn-owner, winter can be brutal and difficult to deal with. But with ample knowledge and preparedness, winter doesn’t have to ruin everything. Winter isn’t really an evil antagonist, but you can’t deny the fact that lawns just don’t love them. Here are some things to think about regarding fall lawn care. There are different seasons around the country. Whether you live in colder areas or sunnier areas, it is in your best interest to take advantage of the fall season to prepare your lawn for wintertime. Basically, there are so little variations on how to approach the lawn during these different seasons, so here is the checklist you definitely must have to take proper care of your lawn before winter season arrives. Fertilizing. Letting grass have very sturdy roots is the best way for plants to be protected from weeds, insects and other parasitic elements. But be very informed with the fertilizer that you are using; apparently the fertilizer you must acquire should be for winter time. Any type of Fall Lawn Food will work for you. Watering. Just because summer has ended doesn’t mean that the time for watering your plants has also ended. Until the first sting of cold, lawns in the Northern part should be watered. For lawn owners down South, watering the lawn every 2-3 weeks until the ground starts to freeze is necessary. Seeding. Grass can be suitable for warm-season or cool-season. Warm-season grasses are for spring and summer and cool-season grasses are planted in fall. Overseeding comes after core aeration and thatching, and you must take advantage of this to repair portions of the lawn; and to make it easier. I used to work for a lawn care company in Springfield IL – Cutting Edge Yard Service. This is where I learned most of what I know about aeration and overseeding and know that this process combines seeding, mulching and fertilizing for you. Maintaining. Trimming your lawn grass for the winter is essential. Cold will hampers growth of your grass, but then they must be long enough to be able to insulate themselves, and short enough to be able to account for snow that could weigh it down. For Northern areas, the length of grass must be 1 ½ inches to 2 inches, and grass for Southern areas should be trimmed to 2 inches to 2 ½ inches. The falling leaves give us a dilemma of whether or not we should rake them or mulch them. There are actually benefits to both. Raking leaves is practical, as most experts say, to prevent the leaves from blocking necessary elements such as air and light from getting to your grass. Mulching a very thin layer of leaves, on the other hand, will decompose and act as fertilizer to the grass, and adds further protection. 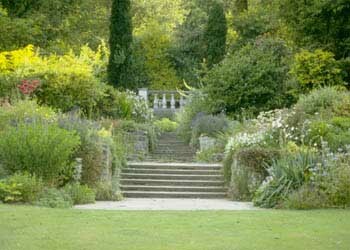 Perhaps you fancy Landscaping an Exotic Garden? If you have imagination, sketch it roughly and don’t forget to think of levels and drainage. You’re almost in the Landscaping business. I label myself as a specialist in exotic garden landscaping. Buying succulent clippings and zeroscaping is my new passion. Here at Landscaping by Landman we like to have a lot of different Agaves in our plans for exotic garden landscaping as well as Aloe. In fact we use Aloe quite frequently as it is one of our standbys for exotic garden landscaping. Of course a lot depends on the property. See this cottage style property and immediately my mind says ‘wild’. Would you agree? The Cacti that I use in my exotic garden landscaping include ferocactus latispinus. The Ferocactus latispinus have heavy hooked spines are fascinating to touch. I don’t use this one in exotic garden landscaping at home with children because if you don’t use care while touching the ferocactus latispinus, they will rip the flesh clean off your hand. Be sure to take care please. Another one of the Cacti that I use while I am working on exotic garden landscaping is the trichocereus bridgessii monstrose. This is a rare monstrose form of bridgessii. This Cacti forms numerous cucumber shapes with long spines. In my exotic Landscaping by Landman business, I also like to use a group of plants in the Crassulacea family. The Crassulacea family has exotic plants in all parts of the world from the hot and dry desert regions to the cold and moist alpine locations. These plants are blessed with a hardy nature and enjoy the widest appeal among plant collectors. Euphorbias are great in the exotic garden landscaping business. They have a great looking grassy appearance and can also tolerate a few degrees of frost. The antisiphilitica comes from Mexico and grows really well almost anywhere where there’s some sun. One thing though, watch out for snails. See a Euphorbia here on the right. My favorite plant in the Crassulacea family has to be the Aeonium “Plum Purdy”. It is actually the first exotic plant that I used in my garden landscaping business before I added exotic to the description. I really like the deep reds and the slight fuzziness on the leaves. If you are interested in keeping up to date on new ideas in landscaping, then please come back often.